For those who enjoy working on engines, cars, trucks, boats, motorcycles, snowmobiles or any other heavy project, take a closer look at the mobile gantry crane. It adjusts up and down and can be easily taken apart for storage or transport. Use the plans options to build it to fit your specific needs. 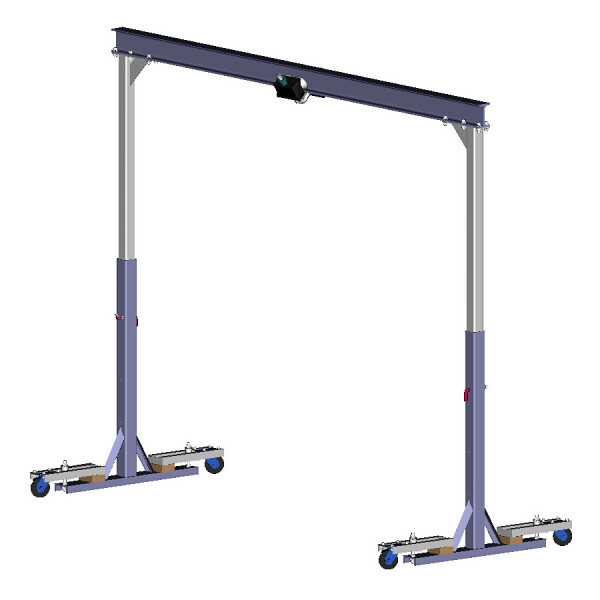 This mobile gantry crane makes a great engine hoist! Boat hoist, or whole car lift! Single I-beam design, 8-12 ft width options. Telescoping legs (length to fit your needs). 2300 lb. to 4400 lb. capacity (steel). Options for Steel (stronger) and Aluminum Beam. Spring loaded wheel assembly plans included. Need a Crane? Here are the plans for an excellent mobile crane and engine hoist. This overhead crane (a mini gantry) is fully adjustable for ease of use and can be disassembled in minutes for storage or portability. Best of all . . . You Can Build It Yourself ! Originally designed for EKG Racing, this mobile gantry crane is heavy enough to do the job, but can quickly disassemble for portability or for storage. It provides roll around mobility with a safety wheel mounting making it stable when lifting. For flexibility, the design has telescoping legs allowing the beam clearance to change vertically from 6 ft to 9 ft so it can roll through a standard garage door, or rise to full height for maximum lift. Plans include easy to follow, fully illustrated instructions, a List of Materials, details for building the pieces, Construction Hints and options – like beam sizes and aluminum. . . . More on What is in the Plans . . .
To make lifting even easier, check out the accessories! — Our “Winching Pole” & Load Leveler is the perfect hoist addition for many gantry style cranes. Also, check out the Beam Clamp (Free Plans) to make your crane even more adjustable. This is how it works. Also please visit our Customer Stories page to see some examples of how other customers customize the project. or even bigger Up-Sized Gantry Crane Plans! * Load capacity for the crane is a static vertical load and is highly dependent on materials used, construction techniques, assembly methods and proper load distribution. Load capacity does not include capacities for trolley, cables, chains or other hoist equipment. Do not exceed manufactures limits. Always use Extreme Caution when lifting. So, Great Plans Are Here At Mechanical Elements!